Кафедра нової і новітньої історії України запрошує в середу, 4 квітня, на науковий семінар “The Shapes of Silence: Soviet-Time Domestic Photography: Between Remembrance and Oblivion”. Доповідачка: д-р Оксана Саркісова, Центрально-Європейський Університет (Будапешт). Початок о 15:00. Місце проведення: ауд. 424 (вул. Козельницька 2а). Domestic photo collections are powerful prompts that allow performing and transmitting personal narratives within and beyond extended families. Such “oral-photographic performances,” as Martha Langdord calls conversations over family albums, are often used by historians and social scientists to unlock personal memories of particular events or to illustrate various historical narratives. Much less frequently, however, photographs are discussed in their own right in connection with themes and figures that remain invisible, silenced, or edited out. Yet multiple silences that permeate conversations about the familial past come to the fore through and in relation with the materiality of images which plays an important role in exposing the contours of narrative lacunas in the micro‑social milieu of the family. This talk focuses on vernacular photography and its relationship with the narrative silences permeating family stories. 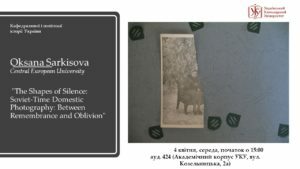 The talk draws on a collaborative project run with Dr. Olga Shevchenko (Willams College) that explores the ways the Soviet era is remembered when people in Russia look through their family photo albums. The presentation will highlight similarities and differences in the ways different generations within one family construe their family histories. For each of them, silence becomes a rich resource in constructing the different versions of the family past.